For the Scholastic commentator on Galen, see Turisanus. Pietro Torrigiano (24 November 1472 – August 1528) was an Italian sculptor of the Florentine school. He was important in introducing Renaissance art to England, but his career was adversely affected by his violent temperament. Torrigiano was born in Florence. According to Giorgio Vasari, he was one of the group of talented youths who studied art under the patronage of Lorenzo de' Medici in Florence. Michelangelo's friend Giorgio Vasari says that Torrigiano instigated the fight because he was motivated by jealousy, and that he was forced to flee from Florence as a result of his act. Torrigiano, having formed an intimacy with Michelangelo, and becoming envious of his distinction in art, one day, when jeering our artist, struck him so violent a blow in the face that his nose was broken and crushed in a manner from which it could never be recovered, so that he was marked for life; whereupon Torrigiano was banished from Florence. He goes on to say that the assault was reported to Lorenzo de' Medici who was "so greatly incensed against the offender, that if Torrigiano had not fled from Florence he would without doubt have inflicted some very heavy punishment on him." Whether or not he was "banished", soon after this Torrigiano visited Rome, and helped Pinturicchio in modelling the elaborate stucco decorations in the Apartamenti Borgia for Pope Alexander VI. After some time spent as a hired soldier in the service of different states, Torrigiano was invited to England, possibly by the young Henry VIII immediately after the death of his father, Henry VII. He produced terracotta sculptures depicting Henry VII, Henry VIII and the ecclesiastic John Fisher. He also probably made the intensely realistic funeral effigy of Henry VII. He was commissioned to create the tomb monument of Lady Margaret Beaufort, mother of Henry VII, in 1510, working to "patrones" or pattern drawings by Meynnart Wewyck. After the success of this work, he was given the commission for the magnificent effigial monument for Henry VII and his queen, which still exists in the Henry VII Lady Chapel of Westminster Abbey. This appears to have been begun in 1512, but was not finished till 1517. The two effigies are well modelled, and there can be no doubt the head of the king is a fine posthumous portrait. John Pope-Hennessy called it "the finest Renaissance tomb north of the Alps". After this Torrigiano received the commission for the altar, retable and baldacchino which stood at the west, outside the screen of Henry VII's monument. The altar had marble pilasters at the angles, two of which still exist, and below the mensa was a life-sized figure of the dead Christ in painted terra cotta. The retable consisted of a large relief of the Resurrection. The baldacchino was of marble, with enrichments of gilt bronze; part of its frieze still exists, as do also a large number of fragments of the terra-cotta angels which surmounted the baldacchino and parts of the large figure of Christ. The whole of this work was destroyed by the Puritans in the 17th century. Henry VIII also commissioned Torrigiano to make him a magnificent funerary monument, somewhat similar to that of Henry VII, but one-fourth larger, to be placed in a chapel at Windsor; it was, however, never completed, and its rich bronze was melted by the Commonwealth, together with that of Wolsey's tomb. The indentures for these various works still exist, and are printed by Neale, Westminster Abbey, (London, 1818). These interesting documents are written in English, and in them the Florentine is called "Peter Torrysany". For Henry VII's monument he contracted to receive £1500, for the altar and its fittings £1000, and £2000 for Henry VIII's monument. Torrigiano was also commissioned to work on the monument of Dr John Yonge (d.1516), Master of the Rolls during the time of Henry VIII, who was entombed in the Rolls Chapel of the now Maughan Library. He may also have been responsible for the tomb of John Colet which was destroyed in the 1666 fire of London, but may have been preserved in a cast of the head. This man had a splendid person and a most arrogant spirit, with the air of a great soldier more than a sculptor, especially in regard to his vehement gestures and his resonant voice, together with a habit he had of knitting his brows, enough to frighten any man of courage. He kept talking every day about his gallant feats among those beasts of Englishmen. When he heard the story of what Torrigiano did to Michelangelo, Cellini says he could no longer "bear the sight of him". The latter part of Torrigiano's life was spent in Spain, especially at Seville, where, besides the painted figure of St. Hieronymus in the museum, some terracotta sculpture by him still exists. His violent temper got him into difficulties with the authorities, and he died in 1528 in prison. According to Vasari, Torrigiano was swindled of his payment by the Duke of Arcus for a sculpture of the Virgin and Child. As an act of vengeance for being fooled as such he mutilated the work with his chisel, whereupon the Duke, considering himself affronted, denounced Torrigiano as a heretic. In other stories, he was carving the Virgin and made a mistake, at which point he defaced the statue in his annoyance, and was seen by clerics and charged as a result. Vasari misdates his death to 1522. Wikimedia Commons has media related to Pietro Torrigiano. ^ a b c Cellini, B, Autobiography, trans John Addington Symonds, New York, Appleton, 1904, pp.18-19. ^ a b Vasari, G, Lives of Seventy of the Most Eminent Painters, Sculptors & Architects - Vol. 4, E. H. Blashfield & A. A. Hopkins (eds), Charles Scribner's Sons, New York, 1902, p.47. ^ a b c Wyatt, Michael, The Italian Encounter with Tudor England: A Cultural Politics of Translation, Cambridge University Press, 2005, p.47. ^ Foister, Susan. "Vewicke [Waywike; Wewoke], Maynard - Oxford Art". www.oxfordartonline.com. doi:10.1093/gao/9781884446054.article.t089182. Retrieved 2019-04-06. This article incorporates text from a publication now in the public domain: Chisholm, Hugh, ed. (1911). "Torrigiano, Pietro" . Encyclopædia Britannica. 27 (11th ed.). Cambridge University Press. Armstrong, Walter (1899). "Torrigiano, Pietro" . In Lee, Sidney (ed.). Dictionary of National Biography. 57. London: Smith, Elder & Co.
Masaccio, born Tommaso di Ser Giovanni di Simone, was a Florentine artist who is regarded as the first great Italian painter of the Quattrocento period of the Italian Renaissance. According to Vasari, Masaccio was the best painter of his generation because of his skill at imitating nature, recreating lifelike figures and movements as well as a convincing sense of three-dimensionality. He employed nudes and foreshortenings in his figures. This had seldom been done before him. Bartolommeo Bandinelli, actually Bartolommeo Brandini, was a Renaissance Italian sculptor, draughtsman and painter. Benvenuto Cellini was an Italian goldsmith, sculptor, draftsman, soldier, musician, and artist who also wrote a famous autobiography and poetry. Giovanni Angelo Montorsoli, also known as Giovann'Agnolo Montorsoli, was a Florentine sculptor and Servite friar. He is today as often remembered for his restorations of famous classical works as his original creations. The Basilica della Santissima Annunziata is a Renaissance-style, Roman Catholic minor basilica in Florence, region of Tuscany, Italy. This is considered the mother church of the Servite Order. It is located at the northeastern side of the Piazza Santissima Annunziata near the city center. 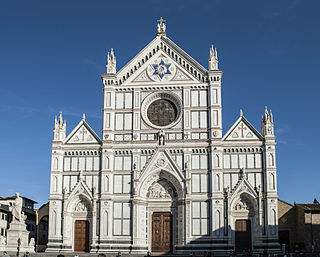 The Basilica di Santa Croce is the principal Franciscan church in Florence, Italy, and a minor basilica of the Roman Catholic Church. It is situated on the Piazza di Santa Croce, about 800 meters south-east of the Duomo. The site, when first chosen, was in marshland outside the city walls. It is the burial place of some of the most illustrious Italians, such as Michelangelo, Galileo, Machiavelli, the poet Foscolo, the philosopher Gentile and the composer Rossini, thus it is known also as the Temple of the Italian Glories. The Accademia di Belle Arti di Firenze is an instructional art academy in Florence, in Tuscany, in central Italy. Hercules and Cacus is a white sculpture to the right of the entrance of the Palazzo Vecchio in the Piazza della Signoria, Florence, Italy. The Brancacci Chapel is a chapel in the Church of Santa Maria del Carmine in Florence, central Italy. It is sometimes called the "Sistine Chapel of the early Renaissance" for its painting cycle, among the most famous and influential of the period. Construction of the chapel was commissioned by Felice Brancacci and begun in 1386. Public access is currently gained via the neighbouring convent, designed by Brunelleschi. The church and the chapel are treated as separate places to visit and as such have different opening times and it is quite difficult to see the rest of the church from the chapel. Michelangelo had a complicated relationship with the Medici family, who were for most of his lifetime the effective rulers of his home city of Florence. The Medici rose to prominence as Florence's preeminent bankers. They amassed a sizable fortune some of which was used for patronage of the arts. Michelangelo's first contact with the Medici family began early as a talented teenage apprentice of the Florentine painter, Domenico Ghirlandaio. 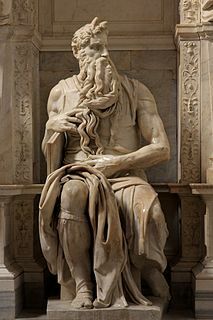 Following his initial work for Lorenzo de' Medici, Michelangelo's interactions with the family continued for decades including the Medici papacies of Pope Leo X and Pope Clement VII. The Brutus is a marble bust of Brutus sculpted by Michelangelo around 1539–1540. It is now in the Bargello museum in Florence. The Altoviti are a prominent noble family of Florence. An anonymous author known as the Anonimo Gaddiano, Anonimo Magliabechiano, or Anonimo Fiorentino is the author of the Codice Magliabechiano or Magliabechiano, a manuscript with 128 pages of text, probably from the 1530s and 1540s, and now in the Central National Library of Florence. It includes brief biographies and notes on the works of Italian artists, mainly those active in Florence during the Middle Ages. Among several other suggestions, the anonymous author has been suggested to be Bernardo Vecchietti (1514–1590), a politician of the court of Cosimo I. The author clearly had intimate access to the Medici court.